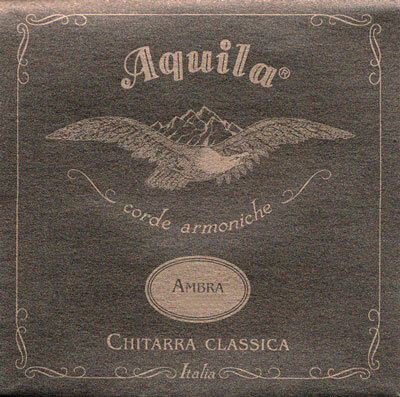 These Aquila Classical Guitar Strings feature High Tension Trebles, Medium Tension Basses - polished white Nylgut trebles with silver-plated copper over Nylgut multifilament basses. A "synthetic gut" version of the Aquila Gut & Silk set. These are one of my favorite string sets. The sonority of the bass strings compliments the trebles beautifully. They have a " darker" sound than most modern strings. I have not had breakage issues with these- I've used several sets. The one thing misleading about these is the description. They are most definitely meant to be tuned to 440hz. I emailed aquila, and the owner wrote me back and told me he personally designed them for standard tuning. It's the true gut strings that aren't meant for standard tuning. 440hz for the 800 set as well. Be careful before you buy these strings. They are NOT for ordinary guitars. Just for antiques and CANNOT be tuned to standard tuning. I realized this too late. I wish there were a warning on the packaging. Trebles are really great,but the 4th string had breakes from 2 weeks.It's problem of aquila strings,I had try different sets.